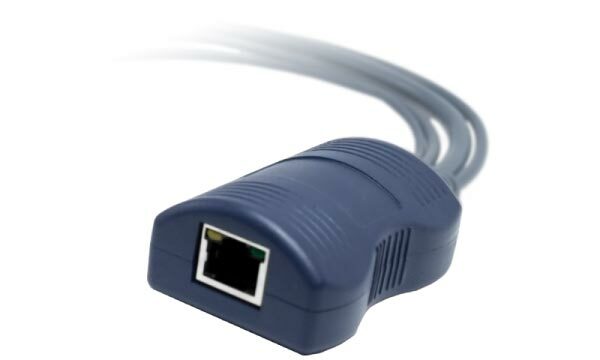 The Adder CATX-USBA is a USB Computer Access Module (CAM) with audio support which connects to the keyboard, video and mouse ports of the computer and converts these signals to be sent over UTP CAT cabling to AdderView CATx KVM switch or Adder extender receiver (either AdderLink X2 Silver or X200). Increasingly important is the support of DDC (Display Data Channel) which allows the communication of a computers video card and the screen. Unless this communication is actively supported, as all Adder CAMs do, then the desired resolution may not be displayed and in some cases nothing will be displayed at all. The CATX-USBA CAM uses USB to pull power from the source host computer, eliminating the need for any separate power supply and thus simplifying installation. The USB cable must be connected to a USB port on the computer that is capable of providing up to 500mA. The CATX-USBA module will check during power up the EDID information available from the KVM switch or extender that is connected to the monitor and passes this back to the computer. If required, you can also harvest and store new EDID information from your display (Read and Store). This will ensure perfect resolution and availability of each video source during switching. Adder CATx-USBA CAM supports USB-HID (1Mb/s) devices such as standard keyboards and mice. Two channel CD Quality audio is supported via the included 3.5mm jack plug. Measuring at only 1 in x 1.75 in x 3 in, and weighing only 100 g, Adder CATx-USBA CAM is a compact unit that fits in your palm, and takes 0U at the rack. Adder CAMs are designed to be a future proof solution - Flash-upgradability via the usb connection Adder CAMs makes updating easy and allows custom EDID adjustment for non-standard operations. Adder CATx CAMs are delivered in a zero configuration state so you can plug them in and start working on them straight away. There is no need for drivers or software to be installed. Adder CATx CAMs are designed to be OS-independednt and work with all known software and computer platforms, including Windows, DOS, Linux, Unix, BSD, Sun OS), Mac OS, NetWare, etc.